Shakespeare is often reinterpreted, reinvented and remade — but for her novel As I Descended, author Robin Talley discovered that revamping a tale from the bard was not as simple as just slapping on new clothes and modern language. There was a whole lot more going on. 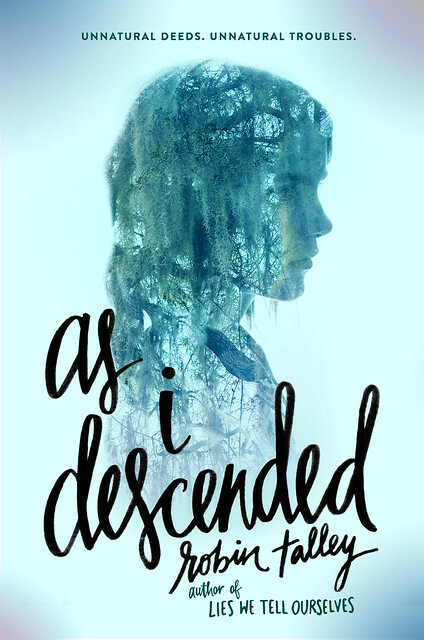 As I Descended is the first book I’ve written that actually has a convenient elevator pitch. “It’s a lesbian retelling of Macbeth, set at a haunted boarding school,” I could say, were I ever in a situation where I was actually expected to describe my book in an elevator. Which hasn’t happened yet, but I’m glad this time around I’m prepared. My first two books both took a paragraph or so to sum up, so they didn’t lend themselves as well to elevators. Or tweets, for that matter. And maybe this isn’t a coincidence, but this time around, the concept for the book came to me a lot faster than usual, too. I knew I wanted to write a retelling ― I’ve always loved retellings of classic stories, from West Side Story to Malinda Lo’s Ash to The Lizzie Bennet Diaries ― and once it occurred to me that the Scottish Play would work beautifully at a modern high school, the basic pieces of the plot fell into place quickly. I almost couldn’t believe no one had already written a YA Macbeth with girls in both of the leading roles. The story is a perfect fit for today’s overachieving high school culture, in which so many girls consider themselves failures if they aren’t valedictorian, sports team captain, Prom Queen, student body president, and every other achievement they can dream up all rolled up into one ― while of course also maintaining a “perfect” body and a vibrant social life. And all while making crucial decisions about which absurdly competitive colleges will lead them into the highest-paid hedge fund careers available. I decided early on that my main characters would be Maria, the second-most-popular girl in school, and her roommate and secret girlfriend, Lily, who dreams of a grand future for them both. Instead of witches, Maria would be manipulated by a team of vindictive ghosts who haunt the 17th-century Virginia plantation that has been remodeled into the exclusive boarding school the characters attend. Macbeth is, obviously, an extremely bloody play. Before I started As I Descended, I’d never even considered killing any of my characters. I’d written dark stuff in other books, sure, but death is so final. Shakespeare was writing about a brave, accomplished medieval warrior who broke character by offing a few specific guys (after a career spent slaughtering presumably less important people). I had to take a contemporary 17-year-old girl whose previous experiences with violence had been limited to a few kicks on the soccer field and make her into a would-be violent criminal. I went through months of false starts before I could figure out how to get Maria (and, to be honest, me) into the necessary emotional place. Shakespeare’s casts tend to be larger than your typical YA novel’s. So after much consternation I wound up combining characters here and there, and scaling others back where I could. In my favorite instance, I fused Banquo and Lady Macduff into one character named Brandon. That meant Brandon and my version of Macduff (I named him Mateo) were now a couple. Brandon and Mateo wound up forming a nice counterpoint to my Macbeth/Lady Macbeth (Maria/Lily) combo, in that their relationship is much less dysfunctional. For months, I carried around a paperback Macbeth that rapidly grew tattered as I constantly flipped through it, searching for relevant lines and pouring over dialogue and soliloquies to figure out exactly what Lady Macbeth was getting at what she muttered that aside, and what Greek myth that weird metaphor about blood referred to. This play has so. Many. Blood metaphors. Dude.) I watched adaptations, too, trying to wrap my head around the way various actors played Macduff, the character I had the hardest time connecting with in the play (though my version, Mateo, wound up being one of my favorite characters in As I Descended by the time I was done writing). Of the books I’ve written, this one was by far the most fun. I got to indulge my inner lit-major geek. I got to go to the library and read critical essays interpreting the Tomorrow and tomorrow and tomorrow speech. I also got to write scenes that scared me so much I had to turn on every light on the second floor of my house before I could force myself to edit them at night. For my next retelling, though, I might stick with a comedy. Less blood. More banter.